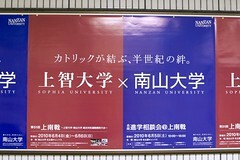 So, spent the weekend in Nagoya for the 51st annual 上南戦 (the annual sports battle between Sophia University and Nanzan University). This was an away year -- it alternates between Tokyo and Nagoya -- so rode the bus with the track team to Nagoya. It was fun, there was partying and sports and stuff. This year I threw the shot put (or, rather, put the shot -- if you're motivated, you can find my results in the pictures. Also -- there's actually a picture of me this time). Other things to say, no time to say them, really, so... There it is. Exhausted and homework to do (soon-ish). Was about time you show your face again here .. busy Doug. I am sure you will tackle Intensive 3 in the end. keep it up! Eh, I've halfway given up, mentally. It's such an ongoing source of depression; pretty much no matter what I do, I don't improve on the tests, I usually have no idea what's going on, I still can't talk my way out of a wet paper bag, and I get a C. I think I'm just setting myself up for disappointment by hoping I can somehow squeak out a B. Also, as far as big dreams go... To get a B? Sad. Ambition FAIL. Also, I may be particularly tired and grumpy today. Or shot the shot put? Well, technically the ball is called a shot (like buckshot or something, it's the event that's the shot put). Putting is a specific type of throwing where you push something out from your body in a kind of lever motion instead of swinging your elbow. Anyway Eiji-kun's best is 12m or so IIRC (he was the winner of the event) when he was in high school and this was his first event as an ichinensei, I think. I figure with better form (I never quite got it right), I might have gotten as much as another meter farther, or at the very least the extra 12cm to 7m. >_< I blame my comprehension fail on teh tired. On that note, I may blow off all my homework today and just sleep instead; the homework really doesn't improve my comprehension any, and the lack of sleep certainly hurts -- I find it impossible to understand anything when I'm tired -- if I don't concentrate, I don't understand, and if I'm too tired, I can't concentrate. So which school won? Or is everyone a winner?